Auberge des VoyaJoueurs: the hotel with 800 games a stone’s throw from the Broceliande forest. 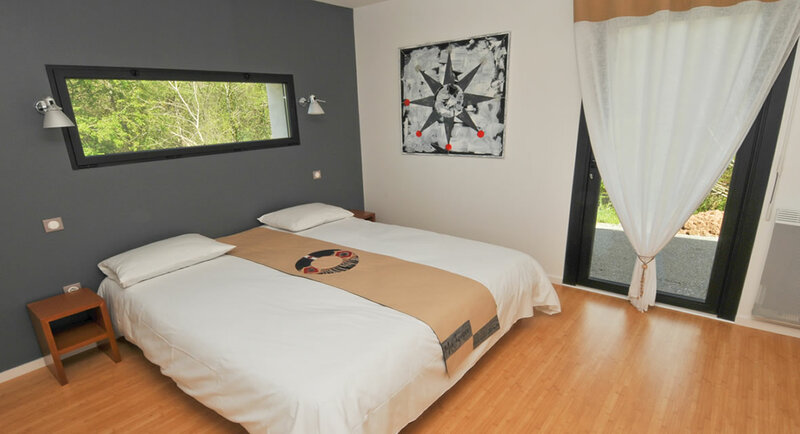 Access to the Auberge des VoyaJoueurs’s 800 games with the advice and explanations from our animators, is included with the room rental. The Auberge des VoyaJoueurs: peaceful rooms, open to nature. All the rooms in the hotel are on the ground floor and offer a view of the surrounding nature. They are in a peaceful setting, away from the game rooms with independent access. With their 100% natural latex bedding, duvets and pillows with bamboo fiber filling, they are a real invitation to relax. After a good night’s sleep, let yourself be woken up by birds singing. As soon as you leave your room, put on your trainers and wander one of the many hiking trails. 1 King size bed (180*200) or 2 single beds (90*200). All the services of the Auberge des VoyaJoueurs are available in the form of gift certificates. You can choose a specified type of stay (type of room, form of restauration, extras…) or give a certificate for the amount of your choice. Payment can be made by check or bank card (over the phone). The personalized gift certificate will then be sent to you by e-mail and post. All our gift certificates are valid 1 year. You can take a virtual visit of the hotel by clicking this link.